Are you a Boy Scout? Is someone in your family a Boy Scout? By request from an Eagle Scout mother, I have produced some memorabilia gifts suitable for Boy Scouts. 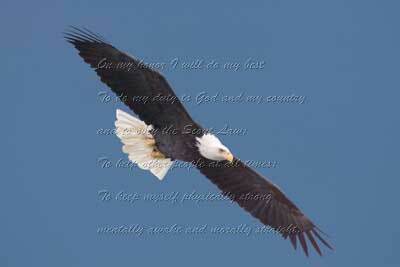 Currently, I have a couple of Bald Eagle prints available. 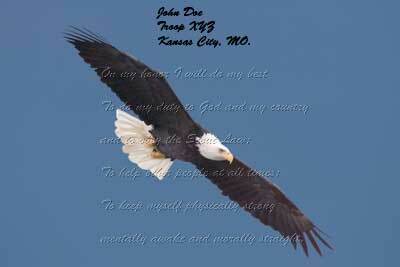 The first print is a standard print of the Boy Scout Oath overlaid on a photo of a soaring bald eagle. The second print is a personalized version of the first print. Personalization includes the Boy Scout’s Name, Troop# and Town/State. Currently, these prints are being sold unframed. I am currently working on making framed prints available.